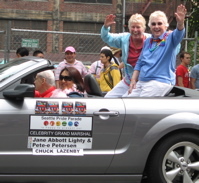 Pete-e Petersen, Jane Lighty & Chuck Lazenby led the Seattle Pride Parade on June 24th. Huge crowds turned out to watch what is hotly being billed as Seattle's best Pride Parade to date. The Inlaws & Outlaws Celebrity Grand Marshals were rapturously received as they made their way along 4th Ave. to Seattle Center for PrideFest. In June 2006, Pete-e & Jane also led the Oklahoma City Pride Parade as Grand Marshals.